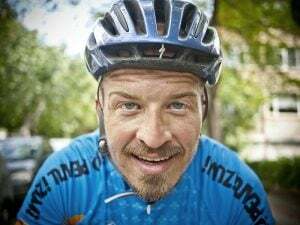 How To Wash Cycling Clothes – What to Use? Washing cycling clothes seems to be a very delicate issue. All riders do wash their clothing, but they don’t speak of it and there’s not lots of info on the internet too. I bet you have also seen quite a couple of worn out cycling clothes with bleached colors, just like from 90’s. So,it’s important to know how to wash cycling clothes. But how to was cycling clothes? 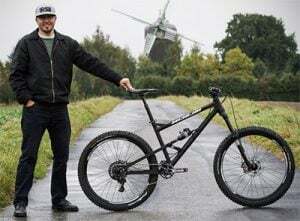 Big Dilemma – Wash by hand or machine? Almost all labels on cycling clothes tell that you should use 30 degree hand wash and not to iron or tumble dry. Let’s see the advantages of both sides. But you should know that what matters is your comfort and the final result. Personally I use white clothes and I do hand washing. 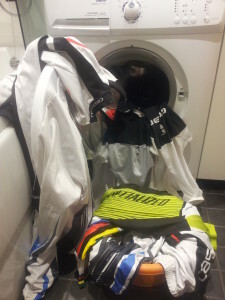 But at times, especially after muddy trails I use the machine to wash my cycling clothes. 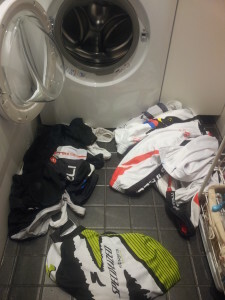 Here are my suggestions on how to wash cycling clothes properly. Don’t wash your cycling clothes with all of your regular clothes.Plus I bet you don’t use padded short or Lycra in every day use. Also, separate different colors. My favorite set is black shorts and white shirt. Of course, I can’t wash them together. But I don’t have enough clothes to use a machine? My TIP is that you can wash your cycling clothes by hand OR wash with similar clothes. Unless they are wool or leather with strong colors, nothing should happen! When washing cycling clothes, you want to zip up your short and long-sleeved jerseys as well as cycling pants. Undone zippers can easily tear up other clothes that happen to be in the washing machine. It’s precautionary and also better for the fabric. On the other hand, it can save you when you left something in your pocket. 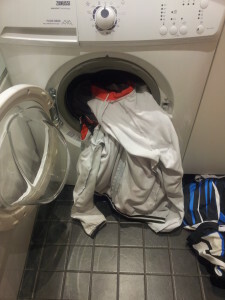 TIP If your cycling clothes are very dirty, then soak them in warm water for a few hours. You will be shocked when you see the water. OR step into the shower after very muddy ride! Sometimes I have training like this! How to wash bike shorts? This is done just like others, but keep in mind to select bike shorts with similar colors, not suspenders. When washing cycling shorts, I would advise you to turn them inside out because this is bad for shorts padding. Also definitely avoid tumble for the same reason. How do I know it? I ruined my padding texture with tumble when washing pants. If you have zipper on your cycling shorts, close it too. What Detergent to Use When Washing Cycling Clothes? 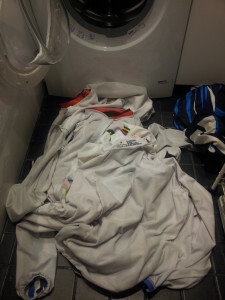 Detergent is the most important aspect when getting your cycling clothes washed. Using the wrong one will ruin your cycling clothes. If not on first wash, then after few times. Also detergents for ordinary sports clothes can ruin your cycling shorts padding. My personal favorite is this PENGUIN APPAREL CARE Sport-Wash Detergent which helps even when your clothes are very dirty. And my second favorite is Sport Suds Detergent. I’ve many different detergents but these two are the best cycling wash detergent’s. When done washing, hang your cycling clothes to dry. The dryer can be dangerous for high-performance fabrics! If they are dry, don’t iron them! I know few cases where mothers wanted good and ironed cycling jerseys-definitely they were unaware. 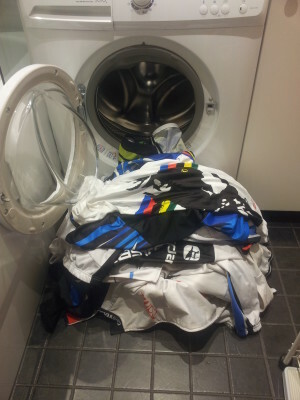 How often should I wash my cycling clothes? To be honest, I don’t wash my clothes after every ride. It is good when you hang them after training so all the humidity can go out. I wash them when they are dirty or after sweaty training. TIP. Wash only when needed. I hope now you know how to wash cycling clothes. Let me know, how you do it! Selection of Sportswear Detergents on Amazon. My favorites above!